Don’t sign our future away! Last weekend Trade Minister, Tim Groser accused NZNO and others of being less than truthful when we say New Zealanders are not being consulted about the Trans Pacific Partnership agreement (TPPA), which is currently being negotiated in secret. He then went on to assure New Zealanders that they would hear the facts when the deal was put before Parliament. Sadly, he neglected to say that when the deal does finally “get to Parliament’ it will be waaaay too late to do anything about it. In fact, Parliament itself is not even able to do anything about it. And as for those purported consultations… a few private briefings of selected health representatives does not qualify as transparent, informed public debate. 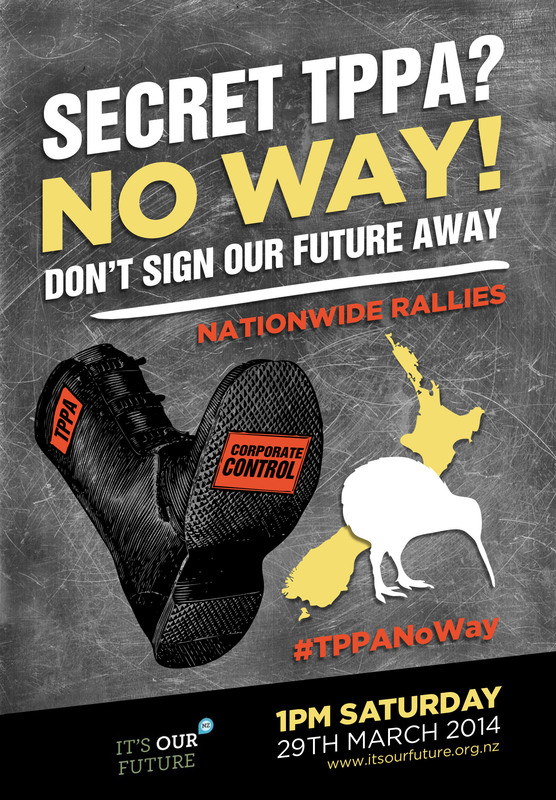 Why is the content of the TPPA a secret to New Zealand stakeholders? We expect transparency and the protection of public health as a key pillar of our social democracy. ‘Commercial sensitivity’ does not justify blanket secrecy where publicly funded health is at stake; especially when, unlike New Zealand citizens, US trade lobbyists have access to the ‘secret’ text. We do know some things about what is being negotiated – I blogged about it here and it’s not good news. Most governments, and it seems that ours is likely to be one, will be deterred from public health regulation because they’re scared of being sued by big business, though a few have refused to be intimidated. Australia went ahead with its plain packaging of tobacco products and is staunchly defending its right to do so against three investor challenges, at a cost of many millions of dollars. Disappointingly, New Zealand reacted by delaying its plain packaging legislation, leaving Australia to defend this important public health decision alone. This agreement was initiated before the global financial crisis in 2008 and both the economic climate and the public’s willingness to accept deregulated markets allowing unbridled corporate growth have changed a lot since then. People are aware that while there have been tremendous gains as a result of new health technologies and medicines, the benefits have not been shared equally. Inequility is increasing globally, regionally and within New Zealand. The TPPA has the potential to exacerbate that inequity if the growth and innovation it promises increases the costs of health care as has been suggested. Come on Minister Groser – release the text, release publicly commissioned information and analysis, and give New Zealanders a say in what you’re signing us up to. Tags: consultation, free trade, Pharmac, public health, secret deals, TPPA, transparency | Permalink. Excellent blog! We are absolutely fed up with the Gross[er] hyperbole about consultation. He might be consulting with the lobbyists of the Corporate world, but he is not consulting with his electorate or the NZ communities who are paying his wages. Is this public servant abusing the Golden Rule of “He who pays the Gold, makes the Rules”? Unless of course he is pandering to other greater interests than the wider NZ community! Could this mean that he is being guilty of treason by selling out the NZ community – especially the Health sector? And what about the gravy train of quasi-legal adjudication panels and their ability to sue Governments and our Companies? No to secrecy and full disclosure BEFORE it goes before Parliament for ratification and possible signing. Everybody needs to see “Fire in the Blood” -official selection 2013 Sundance Film Festival. See how Trade agreements with the USA help the poor get medicine! Well said. Frighteningly the general public continue to sleepwalk to an uncertain future. The turnout in Dunedin protesting the TPPA was pathetic. One Green member and a dozen hippies all shouted down by a drunken lout. (no police in sight as usual) Where are all the senior citizens likely affected by increased drug prices or the electronic media users blindsided by intellectual property “rights”..